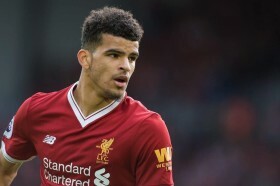 Liverpool striker Dominic Solanke will reportedly join Crystal Palace on a short-term loan for the season after having undergone a successful medical with the south London side. The Englishman has failed to make a single appearances for the Reds this term but he has still attracted widespread interest among the Premier League clubs. According to The Mail, the 21-year-old has chosen to link up with Roy Hodgson's team for the second half of the season and the deal is expected to go through on New Year's Day. Hodgson has struggled to find a genuine goalscorer upfront this term with both Christian Benteke and Connor Wickham enduring fitness issues while Jordan Ayew and Alexander Sorloth have failed to impress. Due to this, he has been forced to feature attacking midfielders Andros Townsend and Wilfried Zaha up top for most of the season but that should change with Solanke's arrival at the south London outfit.